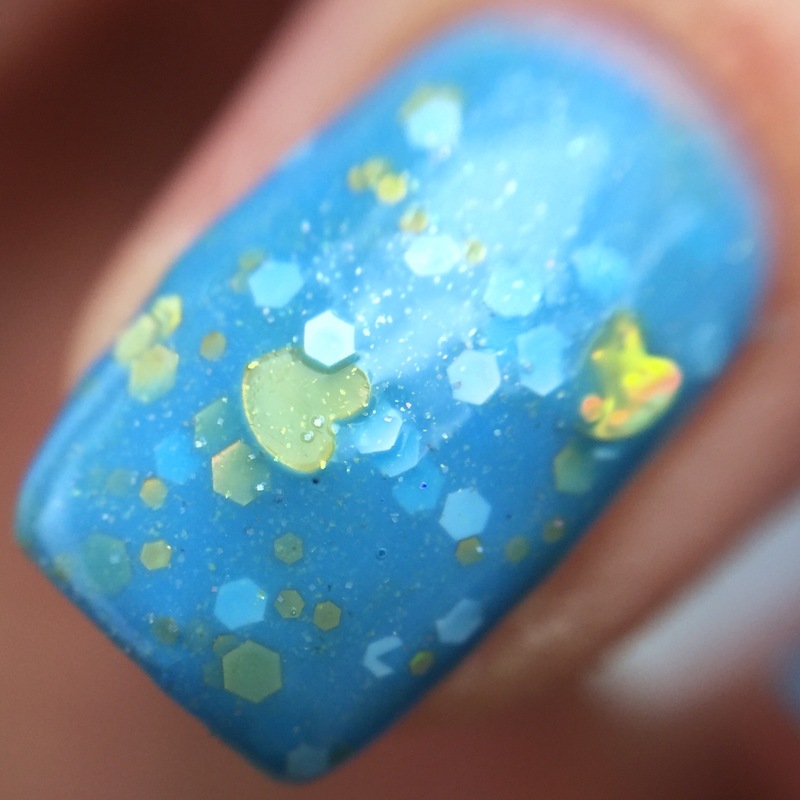 When I was a tiny tot, my dad used to sing the song to me that goes “you are my sunshine, my only sunshine/ you make me happy when skies are gray/ you’ll never know dear, how my I love you/ please don’t take my sunshine away.” As soon as I saw this polish, it took me right back to my dad singing to me, and I was all smiles. Not only did I get the polish, but as soon as it arrived, I took a picture and sent it right to my dad, saying “look! I’m wearing our song on my nails!” Because I am secretly a great big sentimental softy. Also because my dad is great. So now you know how I came to be in possession of Lucky 13 Lacquer’s “You are My Sunshine, My Only Sunshine.” Nostalgia. But it worked out great, because it is really a top-notch polish. 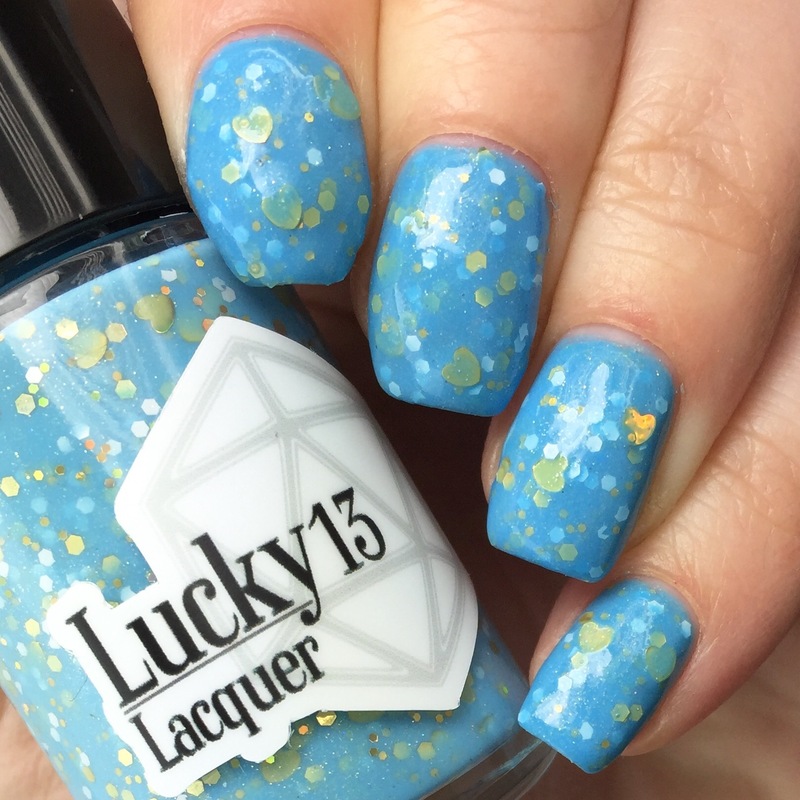 “You are My Sunshine” is a sky-blue crelly with white and gold small hex glitter and gold glitter hearts. It is the perfect polish for a warm summer day spent outside. For these swatches I used three thin coats of “You are My Sunshine.” Honestly, two would have been totally fine for opacity, but I have this thing with crellies where I just keep adding coats. This polish is a little bit on the thicker side (probably because it is so packed with glitter), but that worked in its favor when applying. I had no problems whatsoever getting even amounts of glitter on each nail, and didn’t have to do any fishing to get the hearts out and dispersed. As an occasionally glitter-challenged person, I really enjoyed that this played nice. I topped everything off with one layer of top coat to smooth things out. Love it! 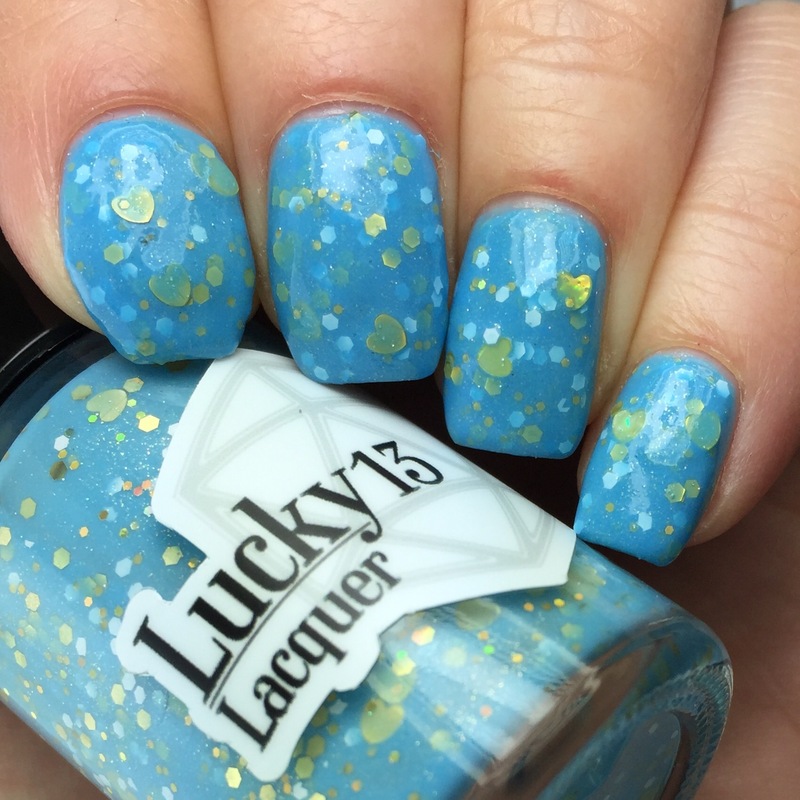 It took my about a minute and a half to fall in love with this polish, and not much longer to become a big fan of Lucky 13 Lacquer. When I got this, I also picked up a couple of shades from the Mad Max collection (appealing to my nerdy collections weakness). I also adore their juicy, glossy top coat (quickest one I’ve ever used). If this polish hits you right in the feels, like it does me, you’re in luck- because it is still available on the website!